As per a WABetaInfo report, WhatsApp now allows users to download deleted media, such as images, videos, GIFs, voice messages, and documents, from its servers again. The report said that the feature was introduced in recent updates between version 2.18.106 and 2.18.110. Gadgets 360 has been able to verify the new feature is currently available in the WhatsApp version 2.18.113 on Android. However, the app does not seem to let us download media files that are too old, instead, asking us to send a request to the sender to send the media again. Interestingly, the new WhatsApp feature also means that the app stores users’ media on its servers even after the files have been downloaded, the report said. Earlier, WhatsApp stored ‘undownloaded’ media files for 30 days and when a user downloaded them, the app used to delete it from the server. However, now, WhatsApp does not seem to delete the data from the server and that enables users to download it again if it was accidentally deleted. This information comes amid criticism over data abuse by Facebook. However, WhatsApp had recently informed its users that their data and communications are secured with end-to-end encryption and nobody in between can read messages and listen to calls – not even WhatsApp itself. 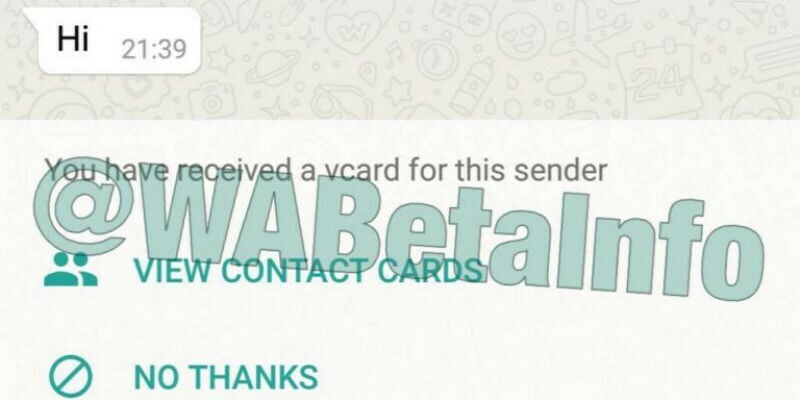 Getting to the vCard indexing feature spotted in WhatsApp beta (v2.18.111) for Android, now, if an unknown user sends you a message, and someone has already sent you a contact card (vCard) for this unknown sender earlier, you will receive an alert in the unknown user’s chat asking if you want to view the original vCard in order to save it. You can discard it, if you’d prefer. We were not able to spot the feature, though WABetaInfo reported its existence.